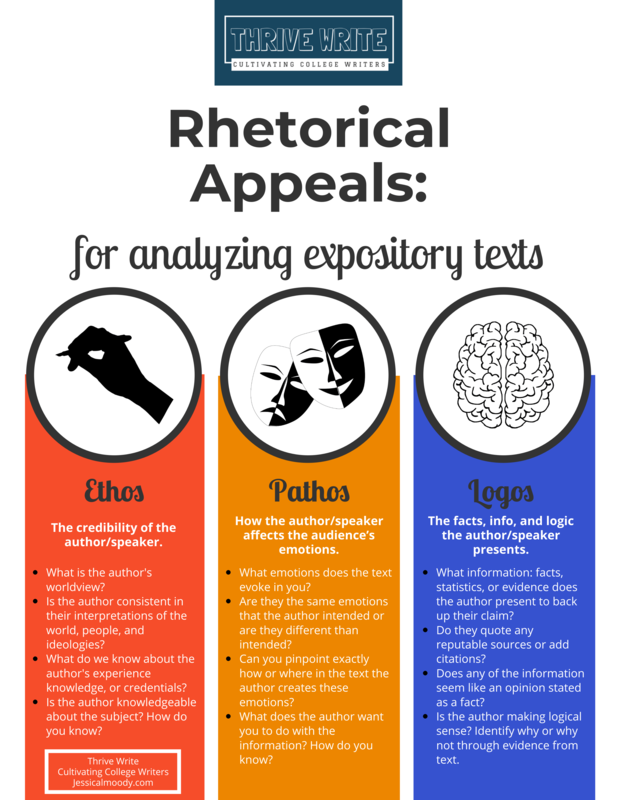 Downloadable Worksheet Time— Rhetorical Appeals: for analyzing expository texts!! Who else is excited?!? One thing that I promised you is that I would provide worksheets and activities for you to practice college writing at home at least once a week, so here is the first of many. This worksheet is meant to give you a beginners knowledge of how to discuss and identify rhetorical appeals in an expository text. Expository texts are any text that is non-fiction: newspaper articles, informational journals, blogs, magazine articles are just the beginning. Note: At a later time we can discuss how any types of videos or audio recordings can also be analyzed for rhetoric. Analyze a newspaper article for rhetoric. Students will begin to see that any text can be analyzed for rhetoric. Students will have a beginning knowledge of the meaning of ethos, pathos, and logos. Print out or find a newspaper article that you are interested in. Use the printable to discuss or write the answers to each question one by one. Know that each question will have an answer and each answer might be challenging to find. Look beyond the obvious!! Skip any questions that you are really struggling with and come back to them later. After you have completed as many questions as possible, go back to the ones you skipped. One that you might struggle with is this: What does the author want you to do with the information? Most likely, he/she wants you to change your opinion on a subject, describe. Think about some additional questions about the author: What opinion does the author have about the subject? Who is the audience of the article? Now respond to the article with your opinion: Do you agree or disagree with the author? Explain. Would you recommend or mention this article to someone you know? Who and why? Leave a comment if you downloaded this and completed the activity. Let me know which question you struggled with the most. I do plan to do a short video tutorial on this soon, so any confusion can be answered there if you let me know. Good luck and blessings to you! !